This Irish Santa is a musical decorations that plays When Irish Eyes are Smiling. Sorry, this musical Irish Santa is now sold out. This Irish Santa is a musical decoration that plays When Irish Eyes are Smiling when you wind him up. 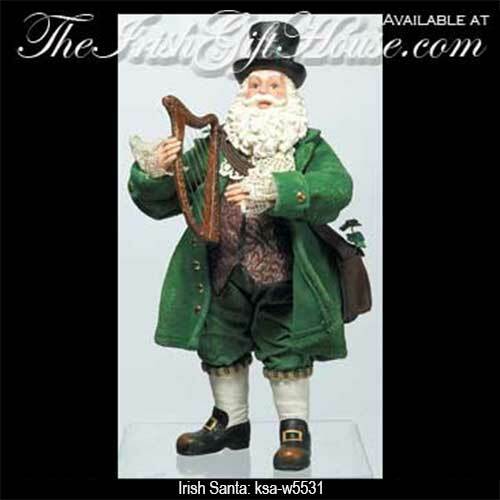 This Irish Santa is an 11 1/2" tall figurine that features a harp on his right shoulder and a bag with shamrocks on his left shoulder. The Golden Harp Irish Santa will make a splendid decoration at Christmas or may be displayed all year long. The KSA Irish Santa is made of porcelain and fabriché and he is gift boxed with a shamrock history card that is complements of The Irish Gift House.